Different types of cabinets need to be cleaned in different ways. Below are some possible cleaning methods of different cabinets. If you have some better ideas add it on the comments or write another piece. Cabinet cleaning techniques are the same whether you're working on a kitchen, bath, or storage area. But you might have to budget different amounts of time based on the room. Kitchen cabinets, for example, face constant challenges from dirt, grease, bacteria, and fingerprints. Grease from cooking or cooking sprays, condensation from temperature changes and steam, and dirt and bacteria from hands and food can stain and damage cabinet exteriors. If you have a busy kitchen, some cabinets might need to be wiped clean once a day. Others might need only a weekly cleaning. Remember to clean around handles and close to appliances. 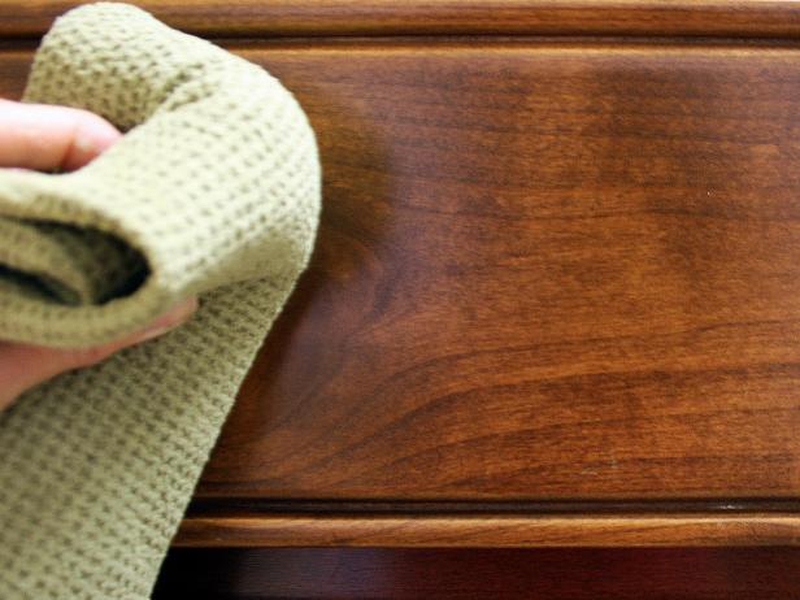 Use the following tips to customize your cleaning routine based on cabinet materials. Cabinets might be solid wood, veneer over wood, or vinyl-coated wood. The wood might be sealed with polyurethane, wax, or varnish, or left natural. Care depends upon the surface treatment. General-purpose oil-soap wood cleaners work well for general care. Whatever the sealant, frequently clean and polish or wax your wood cabinets. Heat and temperature changes can dry wood. Wood cabinets can also be damaged by condensation caused by steam from cooking and dishwashers. Wipe cabinets dry. Do not get wood excessively wet. Occasionally disinfect all surfaces with a diluted antibacterial cleaner without bleach. Wipe on, then rinse with a clean, damp cloth. Dry with a third cloth. Work with the grain of the wood when cleaning and polishing. Painted cabinets that are sealed with one or more coats of oil-base paint are more durable -- and therefore more scrubbable -- than latex-painted wood. Wash painted cabinets with warm water and diluted all-purpose cleaner, wood cleaner, or white vinegar. Do not get the wood excessively wet. Rinse the surface with a second cloth and clean water. Wipe areas that might be contaminated with food-borne bacteria with an antibacterial kitchen cleaner or a solution of 1 tablespoon bleach to 1 quart water. If grease builds up, wipe the cabinets with ammonia and water. Rinse with clear water. For stubborn stains, loosen dirt with a paste of baking soda and water. Don't use abrasive cleaners or scouring pads because they can scratch the surface. Metal cabinets usually have an enamel finish, so they are cared for in the same way as other painted cabinets. Avoid soaking metal cabinets with water because prolonged dampness can lead to rust along seams or cracks. Check for rust spots and touch up with paint for metal surfaces. Wipe laminate surfaces with an all-purpose cleaner or white vinegar diluted in water. Rinse, then dry with a clean cloth. Disinfect surfaces with an antibacterial kitchen cleaner or a solution of 1 tablespoon bleach to 1 quart of water. Pay close attention to seams between cabinet surfaces, such as where the door meets the edge of the frame. Use a soft brush to clean these areas. Do not use abrasive cleaners or cleaning pads. To clean a stain, rub with a paste of baking soda and water. Or lay or hold a cloth or paper towel soaked in lemon juice over the spot. Wipe the insides of cabinets and drawers with all-purpose cleaner or white vinegar diluted in water. Rinse and dry. Use a toothbrush to clean along the edges and cracks. Let the surface dry completely before placing any item back in the cabinets or drawers. Seal unfinished wood or metal surfaces for easier cleaning and to avoid bacterial buildup. Sand lightly and apply a coat of polyurethane (for wood) or an appropriate paint. Install shelf paper to help preserve the surface and foster easier cleaning. Paper is inexpensive but cannot be washed and needs to be replaced frequently. Vinyl is inexpensive and washable but might slide and bunch up in high-use areas. Rubber is washable, slides less often, and offers some cushioning -- making it a good choice for areas prone to earthquakes. Self-adhesive vinyl is washable and stays in place but might be difficult to remove if worn. A low-tack self-adhesive vinyl is washable, durable, and able to be repositioned.